years they have come out with another vice for me to have. 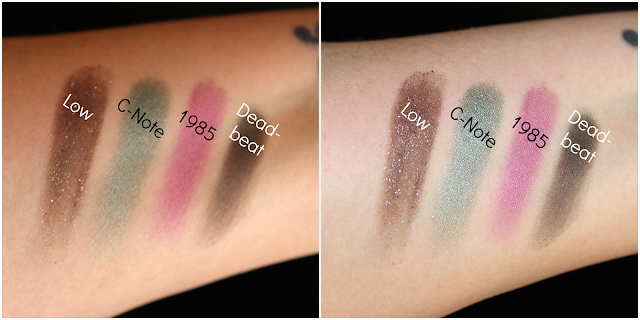 I have reviewed the Vice 3 Palette and I included pictures of the Vice, Vice 2 & Vice 3 for comparison, here, last year. Now it's time to meet the newest vice being doled out by UD, Vice 4. 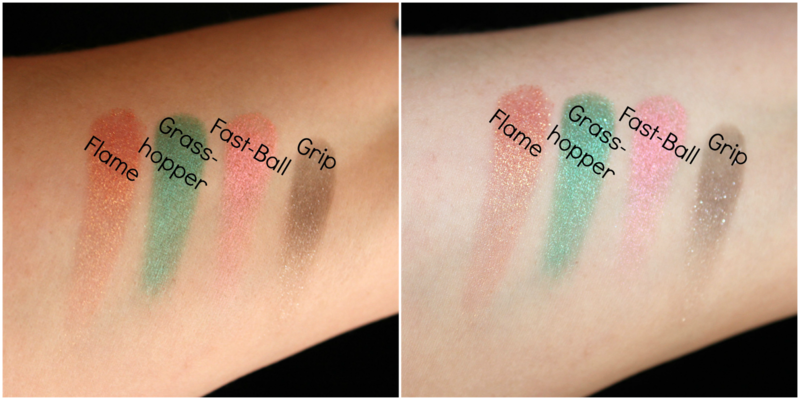 This time around Urban Decay was inspired by their vintage shade Oil Slick. They paid tribute to that shade by drawing inspiration from actual oil slicks and the colors that are found within them. From the shades inside to the packaging and even the textures, the story they are telling with this palette is clear. 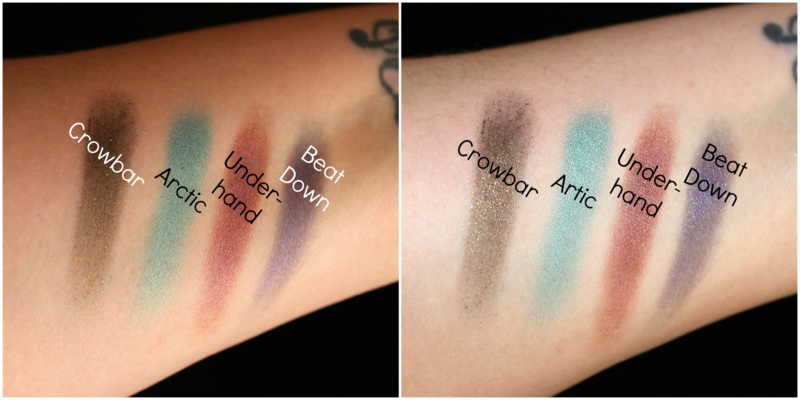 I feel like the Vice palettes are a nod to the classic UD style that started the brand: beauty with an edge. UD used to be more known for it's wild colors and rebellious ways and now you see a bit more Naked palettes than wild ones. The limited edition Vice palettes are everything beauty lovers who remember those days loved and are loyal to. Pictures on the left are daylight and pictures on the right are with flash. 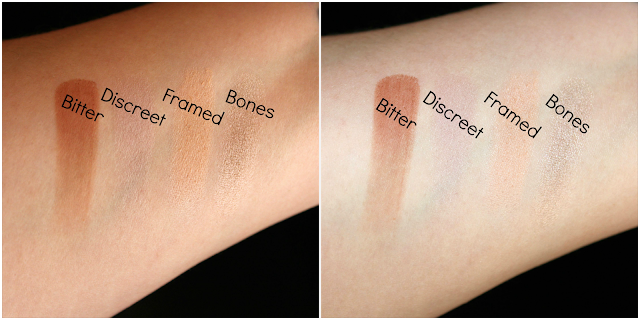 There are three true mattes, Bitter, Discreet & Framed. 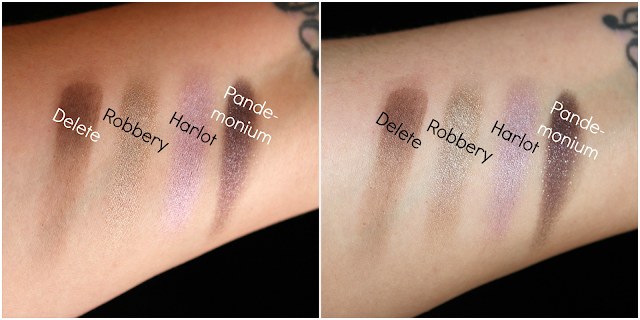 There are also two mattes with shimmer, Delete & Grip. There are six true satins, Bones, Fast-Ball, 1985, Underhand, Harlot & Robbery. There are also five satins with micro glitter, Deadbeat, Beat Down, Arctic, C-Note & Grasshopper. There are four Metallic shadows with Micro glitter, Pandemonium, Flame, Low & Crowbar. I used Framed all over the lid and Bitter in the crease. I then used Flame all over the lower lid space. I used Grasshopper along the lower lash line and then a bit of Harlot on the inner 1/2 of the lower lash line below Grasshopper. I used Bones as a brow bone and inner corner highlight. 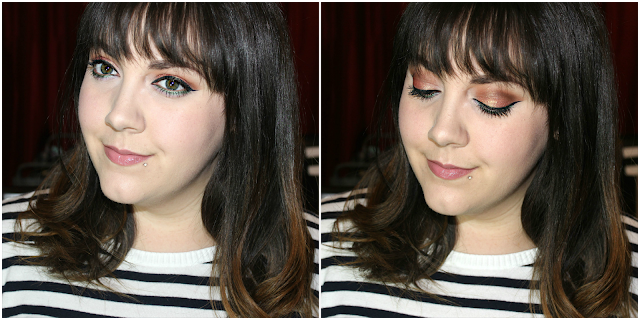 I think this palette did not disappoint. With it's large mirror, a range of 20 colors, great for travel, and an included double ended brush, what more could you want? The quality is everything you would expect an Urban Decay palette to be, if not more. Honestly I think these are some of the smoothest, most highly pigmented shades from the brand with the least amount of fall out. They just keep out doing themselves, these days, it would seem. think of this palette from what you've seen? Is it on your list of limited edition seasonal palettes to pick up? 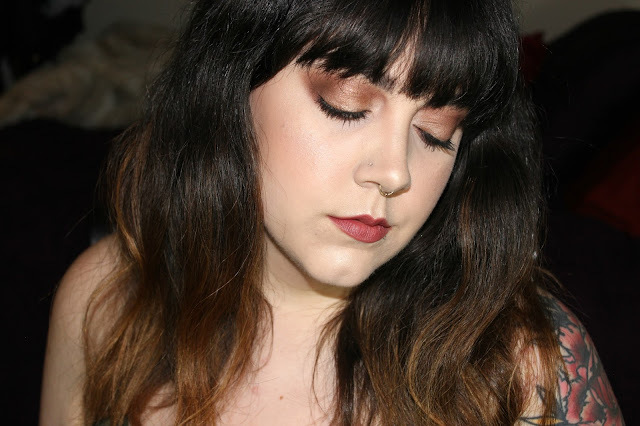 Tell me all your beauty-loving thoughts in the comments! Also, What kinds of tutorials would you like me to do? Bright, neutral, both?